Some people have great advertising budgets or publishers with huge publishing budgets. I, on the other hand, have great friends and have to rely on word-of-mouth and grassroots (If I can use that word in a non-political context) efforts to spread the word about my work. It’s time, again, for me to ask for your help. World Weaver Press’ publicist is going to be working hard to publicize CORVIDAE and SCARECROW but in addition to her efforts I would like to run a blog tour for each. Will you help me with that? If you have a blog I can send you a press kit with images, contributor interviews, excerpts, blurbs, links and all that kind of awesome stuff. Or, I can hook you up with some of my contributors (and/or myself) to do interviews with you, write guest blogs or any other unique thing that you can think of. If you’re at all interested please drop me a line or fill out the form below. I’m trying to sort of schedule dates for things so stuff is spread out, but you’re doing me a favour with this so I’m incredibly flexible. Promo for Corvidae, Scarecrow, or both? What would you like? A presskit? An interview? Guest blog? P.S. I’m more than happy to return this favour. If you have an upcoming release or event that could use a signal boost please drop me a line directly (rhonda at jofigure dot com) and let me know how I can help. It’s almost time for Corvidae to hit the shelves (July 7th!) and you know what that means, right? It means I get to giveaway an ARC to one lucky person. You could be one of the very first people to get your hot little hands on a copy! 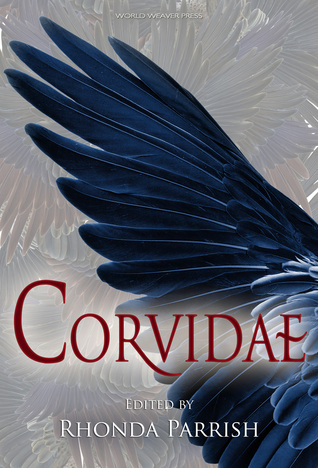 As you may know, Corvidae is book #2 in the series we’re calling “Rhonda Parrish’s Magical Menageries“. That series began with Fae and will continue with Corvidae’s companion anthology, Scarecrow (due out in August). I’ll be straight with you, Fae could really use some more reviews on Amazon. It’s received great reviews, don’t get me wrong, but they mostly seem to be centered on Goodreads* and whether you love it or hate it, Amazon is the 500lb gorilla in this industry and reviews there have more, well, weight, than reviews on Goodreads. So, if Fae reaches ten (10) reviews on Amazon** by the time this giveaway ends on June 2nd I will have the Rafflecopter choose a second winner and that winner will receive an ARC of Scarecrow. *I don’t want to seem ungrateful for the reviews on Goodreads, because I really, truly AM grateful for them. It’s just that now I need to focus on getting some on Amazon as well. Alpena, MI (April 30, 2015) – World Weaver Press (Eileen Wiedbrauk, Editor-in-Chief) has announced the anthologies Corvidae and Scarecrow, volumes two and three of Rhonda Parrish’s Magical Menageries, will be available in trade paperback and ebook Tuesday, July 7 and Tuesday, August 4, 2015 respectively. Hay-men, mommets, tattie bogles, kakashi, tao-tao—whether formed of straw or other materials, the tradition of scarecrows is pervasive in farming cultures around the world. The scarecrow serves as decoy, proxy, and effigy—human but not human. We create them in our image and ask them to protect our crops and by extension our very survival, but we refrain from giving them the things a creation might crave—souls, brains, free-will, love. In Scarecrow, fifteen authors of speculative fiction explore what such creatures might do to gain the things they need or, more dangerously, think they want. Within these pages, ancient enemies join together to destroy a mad mommet, a scarecrow who is a crow protects solar fields and stores long-lost family secrets, a woman falls in love with a scarecrow, and another becomes one. Encounter scarecrows made of straw, imagination, memory, and robotics while being spirited to Oz, mythological Japan, other planets, and a neighbor’s back garden. After experiencing this book, you’ll never look at a hay-man the same. Corvidae and Scarecrow will be available in trade paperback and ebook via Amazon.com, Barnesandnoble.com, Kobo.com, WorldWeaverPress.com, and other online retailers, and for wholesale through Ingram. You can also find Corvidae and Scarecrow on Goodreads.